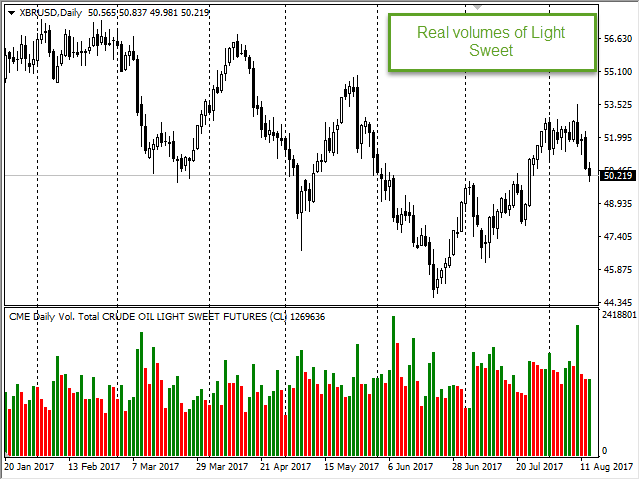 CME Daily Bullettin Real Volume displays the real daily volumes of futures contracts traded on the Chicago Mercantile Exchange (CME). Decentralized markets, such as FOREX, the real volumes are either not available, or local volumes of a broker/liquidity provider are broadcast. 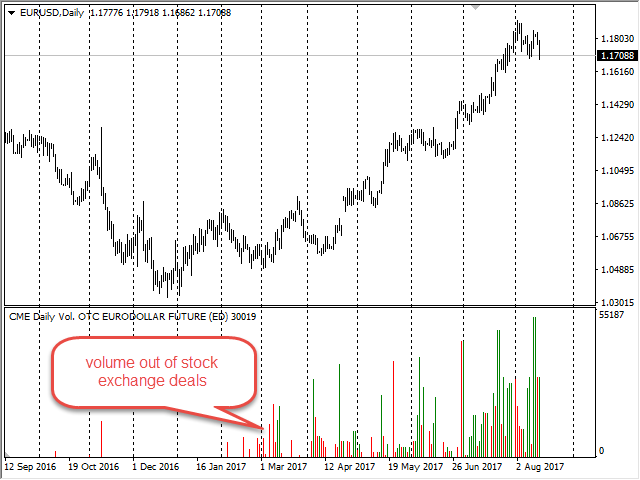 Tick volumes available in the terminal only outline the changes taking place on the market, and can not be used as a full-fledged tool for price analysis. 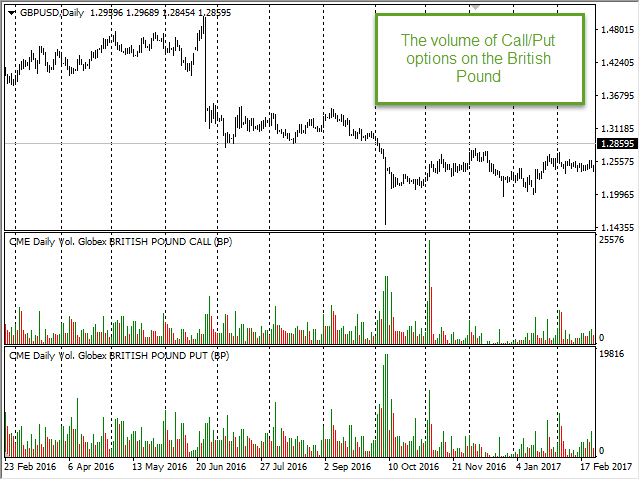 In addition, the indicator is able to display the volumes of the Call/Put option markets, which provides additional information valuable for analysis. MTD ADV - Month To Date Average Daily Volume. Volume Type - one of the real volume types described above. Update Frequency Min - frequency of data update. If the value is zero, the data are not updated. The default value of the parameter is zero, which means updating 1 time per minute. The data on the real volumes are taken from one section of the "daily bulletin" - report of the CME, published weekly. This section is called 'Daily Volume', it is available as Excel files on the official ftp server of the exchange. To update the data, simply copy the corresponding reports to the indicator folder. Detailed instructions on performing the update can be found in the blog How to update CME reports on your PC. The demonstration mode (during testing) does not require the data, the indicator loads them from its internal memory. However, updating the reports is not possible in the demo version, therefore, the volumes in this mode are displayed with some delay. The indicator works on any timeframe, but the data are available only for the daily timeframe; therefore, the suggested working chart period is D1. 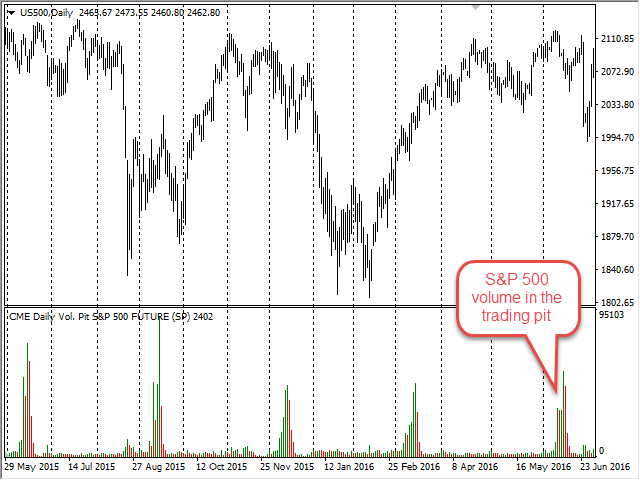 Nevertheless, the volumes of the current trading day are always available, which are updated several times during the trading session. 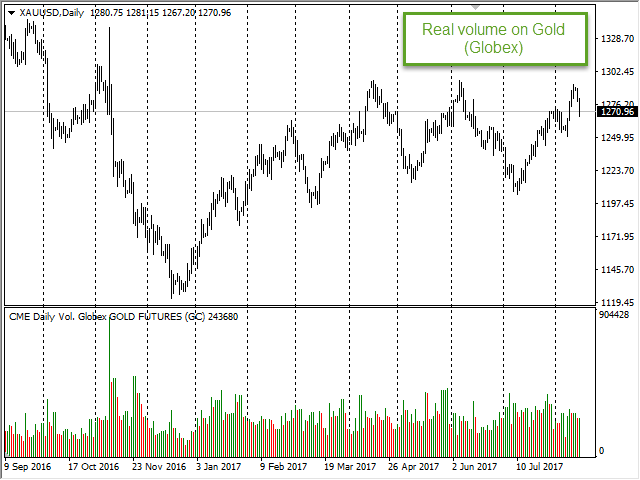 The indicator provides access to volumes of more than 800 futures markets, including the FOREX market (EUR, GBP, CHF, JPY, CAD, AUD, NZD, RUB and some others), metals (gold, silver, platinum, etc. ), energy (oil (several varieties), gas). Indices (S&P 500, Dow Jones 30, Nasdaq-100, etc.). Financial instruments: 30-year bonds, 10,5,2 year treasury notes of the federal government. Commodities (wheat, feeder and live cattle, lean hog, lumber, etc.). However, some uncommon instruments may not be supported in the demo version. The full list of supported instruments is available in the blog: Full list of supported finance instruments of CME Daily Bulletin.